A Sure Remedy is an early, classic Unity tract. "There comes to nearly every individual at times in life hours of suspicion, envy, gloom, distrust and even hatred. In order to make these hours as few as possible, and to make the rallying from them a permanent one, let us look them square in the face, and see what is their cause, and how they may be overcome. "Wrongs of every nature, whether real or fancied, warp the judgment, sour the disposition, and render those who possess them unlovable to all with whom they come in contact. Until these faults can be mastered, one will always appear to disadvantage. "If anyone has really done you an injustice — if they have wronged you — forgive them, and bury the sorrow so everlastingly deep as to make it impossible to unearth it again. This is God's way. It is sometimes hard to do, but it can be done. Read over many times what Charles Fillmore says on this subject. I reproduce his remedy below. Where the words first appeared I know not, or whether they have been preserved at all in book form, but this I know, that a prominent physician in Chicago has had hundreds of them printed, and given a copy to each patient who comes for advice. 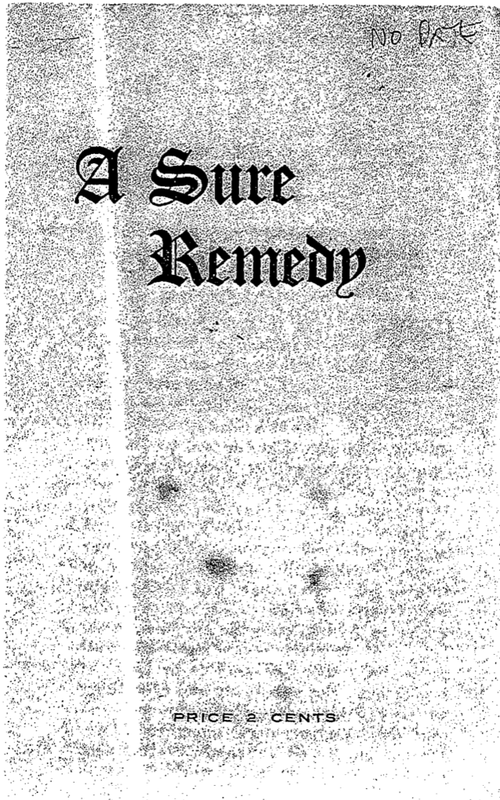 Try Mr. Fillmore's remedy and see the effect "
This "Sure Remedy " referred to by this author, is a little tract which we have been sending out for years, and we are surprised to learn that it is finding its way into the social world in this unexpected way. It also speaks well for a book treating upon so worldly a subject as etiquette daring to incorporate it into its pages. The world surely does move. 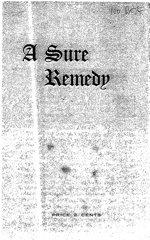 We sell this "Sure Remedy'' leaflet at 2 cents per copy; $1.00 for one hundred. Or, anyone can have it printed and use it as they see fit, with or without the author's name. There is no copyright upon it. Whatever we write that is true belongs to Truth, and we trust Truth to take care of it. Here is A mental treatment that is guaranteed to cure every ill that flesh is heir to: Sit for a half-hour every night and mentally forgive everyone against whom you have any ill will or antipathy. If you fear or if you are prejudiced against even an animal, mentally ask forgiveness of it and send it thoughts of love. If you have accused anyone of injustice, if you have discussed anyone unkindly, if you have criticized or gossiped about anyone, withdraw your words by asking him, in the silence, to forgive you. If you have had a falling out with friends or relatives, if you are at law or engaged in contention with anyone, do everything in your power to end the separation. See all things and all persons as they really are—pure Spirit—and send them your strongest thoughts of love. Do not go to bed any night feeling that you have an enemy in the world. Be careful not to think a thought or to say a word that will offend. Be patient, loving, and kind under all circumstances. You can do this if you are faithful to the silent hour, because there you will be helped to overcome the selfishness of the carnal sense. There is an immutable law lying back of this healing method. God is love, and love is manifest as life. God is thus manifest in and through all His creations. If we do aught to cut off the love of any person, we are cutting off the love of God; hence, we are cutting off the life that flows through all. When we, by withdrawal from our fellows, in any way cut the cords of love that bind us together as men and women, we, at the same time, sever the arteries and veins through which the universal life flows. We then find ourselves mere bundles of strained nerves, trembling and shaking with fear and weakness, and finally dying for the lack of God's love. But omnipresent Spirit ever seeks to flow into us and to stimulate us in every faculty. We must, however, by our words and acts acknowledge this all-powerful Presence as the moving factor in our life, because each of us has inherent free will, which welcomes or rejects all, even God not being excepted. I do now sacrifice these human limitations unto Thee, O Father! I am obedient unto the law of my being and I know that in Thee I am brave, true, energetic, wise, pure, perfect, strong, rich, and courageous. Thou art my almighty resource, and I do trust in Thee utterly. Have you come to this page because of a pressing need or concern? Silent Unity is always available for prayer.